Who says that a fence can’t be used as a design piece? It definitely wasn’t us! You’d be surprised at how many different fence designs we’ve put together for our clients. From ultra-modern fences to colourful vinyl pickets, we’ve helped to create stunning designs. If you’re interested in using your fencing as a design piece, let us show you how to transform your backyard using the right fence design! A low fence is an excellent way to give more definition to a space and to create division between areas. For instance, it can be used to split up a garden area from your yard and still allow unobstructed views to exist. You can even pair it with a matching gate and add a pathway to create an extra personal touch to your garden. 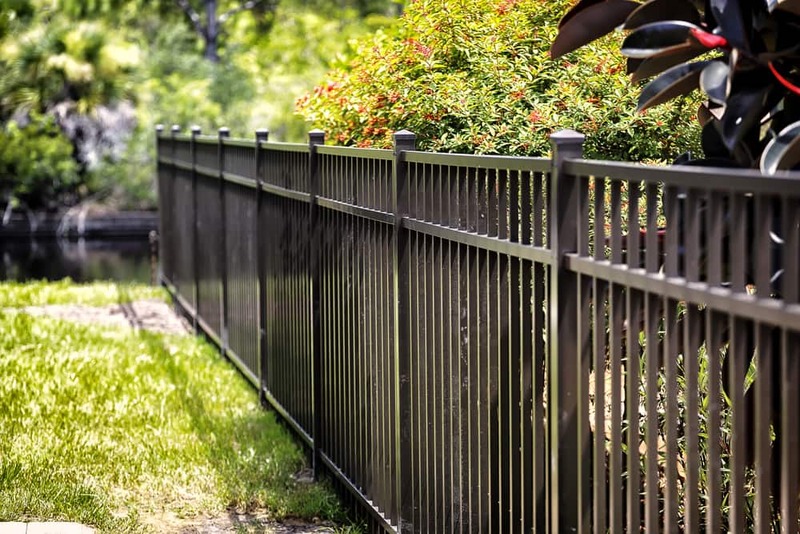 When you use vinyl instead of wood for a picket fence, you can update the classic look without having to worry about repainting it every year. Vinyl is low maintenance and can be selected in any colour you like to create an eye-catching design. Although wood fences are described as traditional, it’s possible to make them more modern. By using different sized wood boards and horizontal wood rails, we can create a unique look that makes a statement. Just by painting your fence in a bright colour you can add a playful touch to the garden. If you love splashes of colour, you can also accent your containers and art to match your fence. And if gardening is your thing, why not hang pots filled with flowers on the fence to create a living wall of colour? Your privacy fence doesn’t have to be boring — you can top it off with a stylish, contrasting panel. A featured lattice top can be added to weave climbing flowers and vines to create an attractive finishing touch. You’ll get more privacy and a beautiful, traditional look. From fences to gazebos, pergolas and decks, Fence Masters can help build you your dream yard. Our fence designs will express your individual style and taste, and add some extra flair to your home. We offer a large selection of quality materials and are Ottawa’s number one choice for installation and customer service. Contact us today — we will be more than happy to assist you!